A LOCAL company has kindly presented the local Enable Ireland centre with iPad devices which will help adults and children in the service centres. 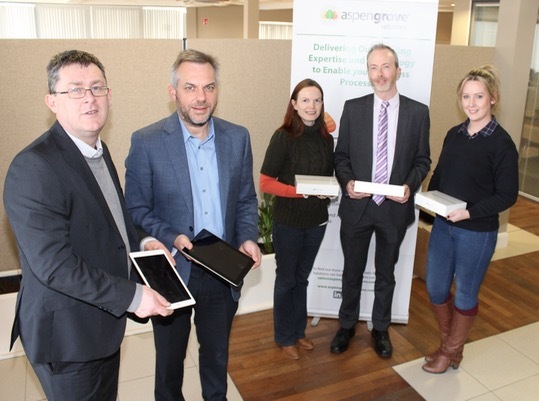 Aspen Grove Solutions presented Sean Scally from Enable Ireland Kerry with the three iPads at their offices on the Castlemaine Road in Tralee on Thursday morning. Charlene Doody from Aspen Grove added; “I attended a presentation at Enable Ireland’s offices in November and was really impressed with the vision of the organisation. We are delighted that we can support Enable Ireland with the donation of the iPads and wish them a very successful 2017”. Aspen Grove Solutions is a leading provider of enterprise-wide technology solutions for the financial and mortgage services industries. Clients include banks, servicers, investors, property inspection and preservation companies, contractors, agents/brokers and asset managers. Enable Ireland provides a range of supports and services to children and adults with disabilities in Co. Kerry.